Bargaining around low pay expanded in the 2015-16 pay round with rises in the National Mimum Wage and the introduction of a higher minimum wage for older workers. Otherwise, settlements as recorded by LRD’s Payline database seem to be stuck in a rut, with an overall median increase of 2.0%. The 2015-16 pay round, which came to an end in July, produced some dramatic increases in minimum pay rates, driven by statutory National Living Wage (NLW) and the voluntary Living Wage, but the overall pay settlement trend remained stuck stubbornly at 2.0%. (see table 1). Seemingly unending curbs on public sector pay — typically 1% — have contributed to that, but the private sector trend in pay settlements is also modest, at 2.0%. These trends suggest a real change of gear is needed in 2016-17 to compensate for the expected rise in the cost of living. This year’s survey is based on 901 settlements from LRD’s Payline database, including 760 where the increase on the lowest basic rate could be calculated — LRD’s traditional measure of assessing pay trends — and 686 where the standard increase affecting most grades or workers could be determined. The distinction between these two measures is more significant than usual this year because more than one in six pay deals (18%) have been affected by measures aimed at raising pay levels for the lowest paid — a big increase compared with 11% in the 2014-15 pay round. We have become accustomed to basic pay rises of 5%, 7-8%, 10% and more, but usually confined only to the lowest paid. The LRD Pay Survey highlights the effect of these and other low-pay measures on pay awards, including the use or non-use of wage-for-age arrangements and the knock-on effects on other terms and conditions. • continuing developments in performance pay and pay structures. Low pay has been centre stage this year. Former Conservative chancellor of the exchequer George Osborne admitted in his 2015 Summer Budget that the UK had a “higher incidence of low pay than other advanced economies”. He quoted evidence from the Organisation for Economic Cooperation and Development, the market economy think tank, that one in five UK workers was low paid, compared to an average of only one in six among OECD countries. Of course, the UK already has a National Minimum Wage (NMW). The statutory minimum for workers aged 21 to 24 has risen this month from the £6.70 figure introduced early in the 2015-16 pay round to £6.95, while the new rate for workers in the 18 to 21 age range is £5.55, £4.00 for those under 18 and £3.40 for apprentices. But for many workers those rates have already been eclipsed by the £7.20 statutory minimum National Living Wage (NLW) introduced on 1 April. The Low Pay Commission has been given the job of working out how that will rise to 60% of median earnings by 2020 — the precise figure will depend upon earnings trends, but was originally envisaged to be over £9 an hour. Osborne’s choice of the name National Living Wage caused some confusion as there was already a voluntary Living Wage (LW), updated last November to £8.25, an equivalent Scottish Living Wage (SLW), and a London Living Wage (LLW) of £9.40. These rates are non-statutory, but influential in the public sector and among some larger private sector employers (that now includes some big, but as yet non-unionised, retail groups). The Scottish government’s public sector pay policy requires the employers it covers pay the SLW. Some employers have deliberately gone beyond these rates, while many trade unionists are pushing for a minimum of £10 an hour. The usual level of bargaining around low pay has expanded this year in response to these developments. Among 162 pay deals (out of 901) where this has had an impact, 45 (28%) have clearly been affected by the NLW, 63 (39%) by the LW or SLW, and 49 (30%) by other measures clearly intended to boost pay for lower-paid workers. The National Minimum Wage (NMW) was the key influence on a negotiated settlement in only five cases. Among these settlements the midpoint (median) increase on lowest basic rates was 3.75%, but the median standard increase was 1.5%. Low-pay measures where known have had a strong effect in agriculture where Wages Orders from Scotland and Wales have been affected. They have also affected almost half of the settlements in the survey covering the retail, wholesale, hotels and catering sector; around a third in “other services”, public administration and education; a quarter in health; a fifth in finance/business services and “other manufacturing”. They include 18 deals (6%) in the transport and communications sector — the biggest sector in the LRD Pay Survey. However, the pay rises associated with these low-pay measures don’t tell the whole story. Many workers have faced employers determined to “claw back” some or all of the cost of low pay measures that they are obliged to apply. There have been reductions in premia for working overtime, at weekends or at nights, moves to unpaid breaks and the introduction of age-related pay. At least in unionised workplaces the balance between new and “old” money and the impact of any changes on other terms and conditions can be negotiated (see table 2). At Ocado Service Delivery, consolidation from existing pay superstructures (service payments and discretionary bonuses) played the main role in raising pay rates by up to 13.1%. At Macrae Foods, Livingston, all pay rates below the NLW threshold increased to £7.20 an hour as a minimum (7.5%) but at the same time the night shift premium increased from 21% to 25%. Other premium rates were amalgamated; overtime is paid at time and half; and a company sick pay scheme was introduced on a six-month trial. At Capital TVL (Bristol and Darwen), the postal grades agreement introduced a new entry rate, regardless of age, of £14,200 a year with two further incremental pay steps enabling new staff to reach £15,000 a year within 12 months of employment. That was done to address the high turnover of staff and difficulty in recruitment at one of its sites. The pay deal for UK Theatres calls for staff under 25 on grade 5 (£6.98 an hour) to be moved up to grade 4 (£7.18 an hour) within six months of their appointment, and at the Co-Operative Group (Retail and Funerals), Tamworth all staff aged 21 and over not earning £7.20 an hour were moved to that rate. At the National Trust (England, Wales and Northern Ireland), the NLW became the new minimum for grade 11 — a 10.77% increase. In a six-month agreement, Young’s Seafood applied the NLW rate for all employees irrespective of age, as did food group Caladero. Moto Hospitality had a staged 18-month deal increasing the lowest hourly rate by 1.5% to £7.30 for staff aged 18 and over, while Windermere Lake Cruises applied the £7.20 rate to all employees over 18 covered by collective bargaining. Hilger Crystals 01/10/2015 A 2.5% pay increase from the 1 October 2015, with some further increases for the lowest paid and for other changes of role. Fujitsu (CWU) 15/11/2015 A further staged 5.1% increase applied to the salary of the lowest pay grade in line with the increase in the Living Wage to £8.25 an hour from the 1 November 2015, bringing the total increase to the lowest paid to more than 10%. Caladero 01/04/2016 All employees regardless of age to be paid the new National Living Wage (NLW) of £7.20 an hour (combined with an earlier increase, a 10.26% uplift for the lowest paid). Pay for those not affected by the NLW to be negotated in May. Flat Glass Council 01/01/2016 First stage of a two-stage, 24-month agreement with a flat rate increase of 18p an hour, equating to a 6.97% increase for General Operative/General Processor and a 2.5% increase for a Craftsperson and Skilled Processor. Heart of England Co-operative Society 01/04/2016 The National Living Wage has been applied to all Customer Service Assistants including those aged between 16-25 years old — a 4.96% increase. Ocado Service Delivery 27/03/2016 Through consolidation of the first three years’ service premium and discretionary bonus schemes, and a 4p increase in the basic rate at the lowest paid sites increased by 94p an hour or 13.1%. Disney Store Distribution Centre (Lutterworth) 01/04/2016 A 2.69% increase on established pay rates and 3.67% on the probationary rate. APCOA Parking (Hackney Traffic Wardens) 01/11/2015 A 2.73% London Living Wage increase to £9.40 an hour together with the 1.5% increase applied in April 2015 gave a total increase of 4.23% on lowest basic pay. Clydesdale & Yorkshire Bank 01/01/2016 A 1.8% pay pot, with a £350 underpin, lowest paid basic salary increased by £750, a 5.27% increase from the 1 January 2016. Fujitsu (PCS) 01/08/2015 Minimum pay increased to level of the voluntary Living Wage (£7.85) and any staff earning less than £16,250 FTE base salary to have their salary increased to that level prior to application of percentage increments. A flat-rate increase of £425 to all members. Local Authorities (England & Wales & N Ireland) NJC 01/04/2016 In the first year of a two-year deal, 1% on pay points from £17,714 and above, but lower pay points increased by up to 6.6%. The paybill increase over two years will be 2.4%, with 0.4% to build “headroom” between the bottom pay rate and the National Living Wage. Police Staff (Scotland) 01/09/2015 1% for all staff earning £21,000pa and over; £300 for those earning less. Contractual progression for all eligible staff. An increase for staff earning less than the Scottish Living Wage up to the equivalent of £15,366 a year, equating to 2.61% for the lowest paid. Scottish Qualifications Agency 01/04/2016 1% for staff earning £22,000 or more, £400 for those earning less (almost one third), no increase for “unsatisfactory” performance, but annual salary for Grade 1 staff, including Modern Apprentices, increased to £16,150 (Scottish Living Wage ), a 7.6% increase. Maritime and Coastguard Agency 01/08/2015 Imposed 1% award with contract “modernisation” changes ending progression and 6.27% on the Administrative Assistant spot rate. An underpin of at least 1% of the voluntary Living Wage (£177 in London, £152 outside), but staff under poor performance measures do not receive a pay award. Higher Education 01/08/2015 1% on all pay spine points except 1-8 where increases ranged from 2.65% to 1.2%. The 2.65% on point 1 equated to the Living Wage Foundation figure. “Noted” by UCU and Unite who rejected the offer. National Trust (England/Wales/NI) 01/04/2016 All staff paid the new National Living Wage (NLW) of £7.20 an hour, not just those members over 25, the NLW has become the new minimum for Grade 11, an increase of 10.77%. UK Theatres 04/04/2016 Second year of a two-stage two-year agreement with a 3% increase from 4 April 2016. Staff under 25 on Grade 5 (£6.98 an hour) must be moved up to Grade 4 (£7.18 an hour) within six months of appointment. National Museums Scotland 01/04/2016 Grade 8 salary increased from £15,366 to £16,150 a year, a 5.1% increase. Grade 7 pay points merged to a single pay point of £17,000 (shift pay is now calculated on that amount). Compensation for weekend allowance. Despite the increases in statutory minimum wage rates, the central trend in pay settlements has been stuck at 2%. That’s the midpoint (median) figure among pay rises that came into effect between 1 August 2015 and 31 July 2016 — the increase on their lowest basic rates (see table 1). Half of all pay rises fell within a central range of 1.5% to 2.72% (known as the “interquartile” range). Only 2.5% of settlements (23 agreements) were recorded as pay freezes, although a similar number of other deals left salary rates unchanged, while awarding individuals a pay rise of one kind or another. The median standard increase was also 2.0%, but the central range was lower, 1.3% to 2.5%, confirming that pay rises for most bargaining groups have struggled to get above 2.5%. The LRD Pay Survey focuses mainly on unweighted figures. Taking the number of workers covered into account (where known) often produces contrasting figures. In the 2015-16 pay round, the weighted median increase on lowest basic rates was 2.5% (higher than the 2% mentioned above), but the weighted standard increase median was only 1.0%. While most pay agreements in the survey were defined as percentage increases, cash sums played a role in almost one in 10 (9%) settlements. The sluggish level of pay awards, except where boosted by low-pay measures, has been matched by a very similar level of growth in Average Weekly Earnings (AWE), as measured by the Office for National Statistics. Earnings are now growing slightly faster than the median level of pay settlements, as they did in 2014-15, but only after falling behind both inflation and pay settlements for a number of years. In the year to July, the increase in AWE “regular pay” which excludes bonus payments (averaged over three months) was 2.2%. Earnings grew slightly faster in the private sector, by 2.4%, but were held back in the public sector to 1.4%. The chart above shows LRD Payline median pay settlements for each pay round (increase on the lowest basic rate, unweighted); the all items Retail Prices Index (annual % increase, the 2016 figure is an average over 9 months); and Average Weekly Earnings (the annual percentage increase in regular pay, taking the three-month figure to July each year). Price inflation hit very low levels during the pay round, making it easier for pay and earnings to overtake the rising cost of living. The Retail Prices Index (RPI) fell below 1% (to 0.7% in October 2015), but then rose to a high of 1.9% in July, averaging 1.3% over the pay round. Consumer Prices Index (CPI) inflation started the pay round at zero, and briefly dropped below that before rising to 0.6% by July. The average CPI increase for the pay round was 0.2%. 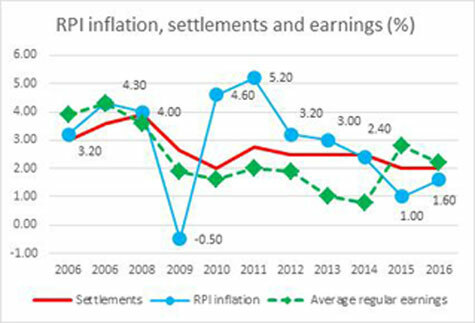 As a result of these conditions, three-quarters of pay deals represented a real pay rise compared with RPI inflation (median real value 0.7%) and 95% beat CPI inflation (median real value 1.7%). However, looking ahead, retail inflation has already hit 2% and is expected to rise further. The RPI is still the main point of reference for negotiators, in the private sector at least, featuring in more than eight out 10 agreements that refer explicitly to inflation. Where employers insist on using the CPI, unions often negotiate underpinning protection (see table 3). Affinity Water (previously Veolia Water) Second stage of a three-stage 36-month agreement, linked to CPI with a minimum of 1%, from 1 April 2016. Scotia Gas Networks C Business Third stage of a four-stage, 48-month agreement based on CPI April 2015-March 2016 (average 0.13%) but underpinned by a minimum 1%. Pegler Yorkshire Second stage of a three-stage, 36-month from 1 January 2016, based on the CPI figure for December 2015, but underpinned at 1%. Spirit Aerosystems (Europe) Fourth stage of the 10-stage agreement based on the average CPI rate for the previous year, with a minimum underpin of 1% and a maximum cap of 4%. Dwr Cymru/Welsh Water A five-stage 60-month agreement paying an increase based on CPI or 1.5% each year. Employers in Voluntary Housing 1% from 1 April 2016 in the second stage of a two-stage, two-year deal based on November 2015 CPI plus 0.5%, underpinned at 1% (lowest basic rate increased by 3.07% in line with Scottish Living Wage). Long-term deals delivered around four out of 10 pay settlements in the survey, similar to the 2014-15 pay round, almost back to pre-recession levels. Unusually, the median pay rise from long-term deals was no higher than among short-term or one year pay deals (2.0%). Usually there is a premium and that was true for existing long-term deals without an inflation link (median rise 2.5%) but they were offset by lower inflation-linked long-term deals (median 1.7%, 1.6% for all inflation-linked deals). That may have discouraged negotiators from reaching new inflation-linked deals. However, British Airways pilots had a 2% increase based on paying the higher of 2% or December 2015 RPI (1.2%) in the first stage of a 3 stage 36-month agreement. The workforce at Wessex Water were midway through a pay deal based on RPI minus 0.75% (an unusual arrangement). As RPI inflation was so low, a new four-year 48-month pay deal was agreed, based on the RPI figure for November 2015 minus 0.1% (RPI was 1.1%), generating a 1% increase. In addition, over a quarter of the new long-term deals that did not refer to inflation for their first stage will do so in future stages. They were most common in the rail sector, but there were examples elsewhere in transport and in engineering, with just a handful of examples in other sectors. A quarter of these involve formulas based on CPI inflation rather than the RPI. A significant minority of employers this year used short-term deals, staged and unstaged, in an attempt to manage implementation of the National Living Wage. Short-term staged deals (significantly shorter in duration than two full years) typically increased lowest basic rates by between 3% and 4%. The median increase on lowest basic rates in the public sector, 1.1%, was well below the private sector figure of 2.0%. And when weighted by workers covered the gap is even wider: a 1.0% public sector median compared with 2.5% in the private sector. The public sector employs 5.33 million people (June 2016) compared with 26.44 million in the private sector, but there are more union members in the public sector — 3.8 million or 54.8% of the sector’s employees. Despite some improvements in the private sector, union membership stands at 2.7 million, or 13.9% of employees. Collective bargaining is more widespread in the public sector too and for that reason public sector deals play an important part in the LRD Pay Survey (179 public sector agreements covering approximately 4.7 million workers together with 726 private sector deals covering just over 2 million workers). Central government policy is to limit average public sector awards to 1%, although in some cases it has tried controlling overall pay budgets rather than average pay. There has also been a drive to eliminate pay progression, and pay awards must be applied “in a targeted manner within workforces to support the delivery of public services”. The devolved governments have their own approaches and in Scotland the 1% cap applies to the cost of increasing basic pay for staff earning above £21,000. It went with a commitment to pay the Scottish Living Wage and a minimum pay uplift of £300 in each year (excluding any increase paid for progression) for all staff earning less than £21,000. The impact of prolonged pay restraint has been felt at the Forestry Commission. An imposed 1% pay bill award saw some staff receiving less than 1% last October. Over half got non-consolidated awards only, while others found themselves stuck further down the pay ranges with no way of ever progressing to the rate for the job (progression was suspended in 2010 and formally removed last year). This can have equal pay implications if people can no longer get to the same rate for the job, or are “leapfrogged” by promoted staff. A comparison of earnings and pay settlement trends confirms the impression that, outside of low pay-related rises, no group is “forging ahead” towards higher pay rises generally. In the year to July, average regular weekly earnings grew by 2.8% in manufacturing (which provides 2.34 million jobs) compared with 2.0% in the much larger services sector (25.2 million). However earnings can be affected by factors other than rising basic pay — like changes in the makeup of the workforce or hours worked — and that lead for manufacturing is not reflected in the LRD Pay Survey. Across the broad manufacturing sector, the median basic pay increase was 2.1%, (interquartile range 1.8% to 2.6%), while the standard median was 2.0% (interquartile range 1.63% to 2.5%). Within manufacturing, earnings growth has been highest in chemicals and man-made fibres (5.8%). Pay settlements in the chemical, mineral and metal sector were above average at a median of 2.2% (2.4% weighted, 2.1% standard). The staged pay deal at GlaxoSmithKline was worth 2.9%. In engineering and allied industries, regular earnings grew by 3.9% and here again the median pay settlement level was a little above trend 2.25%, 2.72% weighted (the standard increase figures were no different). It was a different picture in “other manufacturing”. Earnings were up by 3.6% in food products, beverages and tobacco, but only by 1.9% elsewhere (textiles, leather and clothing earnings fell by 0.4%). However, the LRD Pay Survey median for “other manufacturing” was steady at 2.0%, even though 13 out of 90 settlements were affected by the NLW, including Peter’s Food Service (lowest basic rate up by 6.66%). Turning to the service sector, which accounts for almost three quarters of LRD Pay Survey settlements, the median pay rise was 2.0% (based on 537 lowest basic rate increases). The interquartile range was wider at 1.25% to 2.96%. The standard increase median was 2.0% (interquartile range 1.1% to 2.3%). Public sector pay curbs contributed to these more variable figures. Among private sector services deals, the lowest basic rate median increase was 2.0% (interquartile range 1.6% to 3.0%) while the standard median was also2.0% (interquartile range 1.6% to 2.5%). Among public sector services deals the lowest basic rate median increase was significantly lower at 1.1% (the interquartile range was 1.0% to 2.69%) while the standard median was 1.0% (interquartile range 1.0% to 1.1%). In wholesale, retail, hotels and restaurants, earnings rose by 2.9% (wholesale 4.3%, retail and repairs 3.1%). The median level of pay settlements was the highest by sector with a 3.0% median (4.0% weighted, 2.45% standard). Thirteen of the 54 agreements were affected they the NLW, a further five by the voluntary Living Wage (including IKEA, Lidl and Aldi), and seven by other measures (Tesco put its 2014 retail base rates up by 1.5% plus a further 12p on “established” rates, having previously raised its Grade C starter rate to £7.20 and then £7.24 an hour). Earnings in transport and storage rose by 1.5%, but did not rise at all in information and communication. Pay settlements in transport and communications, the biggest sector in the LRD Pay Survey, had a basic and standard median of 2.0% (1.6% weighted). Earnings in the broad finance and business services sector rose by 2.0%, but ranged from 5.0% in administrative and support activities to 3.6% in financial and insurance activities, 1.2% real estate activities and - 0.9% in scientific and technical activities. The pay settlement median was 2.0% but the weighted median was 1.0%. While Tata Consultancy Services settled at 2.4% across the board plus 0.5% on the employer’s personal pension contributions, the much larger Lloyds Banking Group applied a “market movement” of 1.0% pay groups and pay ranges. The pay bill increase was 2.0% and individual employees received increases of between 0.5% and 5.0% (except “under-performers” and those already above their maximum). In public administration, earnings have risen by 1.0%. The pay settlements median was 1.11% on lowest basic (1.0% standard), but the weighted figure was 6.6% corresponding to the new minimum rates under the Local Authorities England, Wales and Northern Ireland NJC agreement (pay points below £17,714 increased by more than the 1%). Average regular weekly earnings in education have risen by 0.7%. In the LRD Pay Survey the settlement median was 1.25% (1.0% standard and weighted). For Further Education England, the Association of Colleges recommended 0% and did not negotiate with the unions any further. FurtherEducation Wales saw a 1% rise. Scottish Further Education lecturers (who took strike action on 17 March) had a flat rate pay uplift of £450. Salary levels for school teachers in England and Wales, in Scotland and in Sixth Form Colleges rose by 1%, but rises of up to 5.57% applied to the lowest support staff salaries. Higher education academics and staff also had higher rises on the lowest pay points (up to 2.65%) but their general pay awards were for 1%, in common with the public sector. In health and social work, earnings rose by 1.0%. NHS pay rates generally rose by 1% but thanks to Living Wage commitments the lowest Agenda for Change salaries rose by 4.0% in Wales and 5.03% in Scotland. Among private sector employers, Oxfam had a 2% headline increase; RNIB an increase based on RPI plus a £250,000 performance pot; and the National Council for Voluntary Organisations a 2% increase across all grades (with a little more for the lowest paid due to the London Living Wage). In the other services sector average regular weekly earnings apparently rose by 8.4% but pay settlements matched the overall survey with a basic increase median of 2.0% (1.8% standard increase). However, the weighted figure was higher at 3.0% and settlements at that level included the National Gallery (where PCS members took prolonged strike action), UK Theatres and at the Overseas Development Institute (see bottom of third column). In agriculture, forestry and fishing, earnings rose by 6.3%, but negotiated pay increases were much lower. Agricultural wage rates rose by 1.4%, but 3.07% for the lowest grade reflecting the increase in the NMW rate for 21 to 25 year-olds; by 2.0% in Northern Ireland; and by 6% in Wales following the resurrection of its Agricultural Wages Order. Many workers at the Forestry Commission, as already mentioned, didn’t even get 1%. The electricity gas and water supply sectors have seen a 4.5% increase in average regular weekly earnings but mining and quarrying saw no increase. The LRD Pay survey recorded a median pay rise of 1.5% in the sector, reflected at companies like Anglian Water, Drax Power and Dwr Cymru/Welsh Water. In construction, average regular weekly earnings rose by 3.0%. Pay settlements, on a median of 2.5%, were determined largely by multi-employer industry agreements or in some cases (for contractors like Mears Group) by the local authority pay settlement. The biggest of the industry agreements, the Construction Industry Joint Council (CIJC) was for 2.5% and the same increase applied in the Plumbing industry (England and Wales JIB) and at City Building Glasgow. Almost 17% of pay deals explicitly affected pay additions that supplement basic wages or salaries, very similar to the 2014-15 pay round. Bonus or incentive payments were referred to less frequently than in 2014-15, explicitly affecting around 7% of settlements. In many cases negotiated deals simply “flowed through” to pay additions, but there have been real improvements as well as cutbacks. Improvements include London Weighting (at CAFOD and for Network Rail managers); Christmas working payments (City Cruises); shift premia (Grupo Antolin); overtime premia (DHL Preston Brook and Air Products); travel allowances (Eurostar International); and service-related payments (Expert Logistics, Crewe and Princes Foods, Long Sutton). There were individual performance awards at the Department for Education (up to £1,350 to£3,150 for the top 10% of performers) and at City and Guilds Institute (8% to 10%); profit-sharing payments including a 1% scheme at Urenco, an extra week’s pay at food products group Dailycer, and £1,000 to £2,000 at Bentley Motors; and productivity payments of £132 to£216 per month at Trulife Healthcare. In other cases, bonuses were consolidated into basic pay (such as the £663 attendance bonus at Kerry Foods) or simply withdrawn. Around 11% of settlements had a performance pay angle, slightly more than in 2014-15, while around 7% addressed pay structures. Two-thirds of performance pay settlements were in finance and public administration. At TSB, the 2.5% pay budget was distributed through a matrix providing increases of up to 5% depending on rating (“pioneer” or “on-track”). In this case almost 90% received increases of 2.5% or more while pay band minima and maximum were increased. In contrast, employees at Geoban (Santander) received a 2.1% increase regardless of their position in the salary range or their performance rating. At the British Library, the government’s requirement to remove the incremental pay structure by April 2016 saw a new pay matrix linked to performance and position in the pay grade. The Insolvency Service pay deal involved lump sum payments of £1,400 to £1,800 as a buy-out for staff who would have been entitled to progression. At the Planning Inspectorate, the 1.12% pay bill increase exceeded the Treasury maximum of 1%, but was allowed due to progress already achieved on reforming the pay structure. It allowed for discretionary pay progression at 1% of base pay subject to satisfactory performance, but pay rates were also increased by 1%. • communications Telefonica managers, 2.3% of the paybill; and at Accenture Learning a 2.1% pay pot. However, at the goverment agency, the Overseas Development Institute, there was a move away from individual performance-related pay increases, while non-consolidated performance pay was suspended at the Scottish Qualifications Authority.